Mt. Athos, February 9, 2019 – The gates of St. Panteleimon’s Monastery on Mt. Athos were closed to a visiting Ukrainian schismatic bishop and his delegation today. Archimandrite Evlogy, the abbot of the Russian-tradition monastery, explained to “Bishop” Paul of the Diocese of Odessa and the Baltic of the Ukrainian schismatic church and those with him that they could not enter the territory of the monastery because they are not recognized as Orthodox there, reports the Union of Orthodox Journalists and Romfea. Abbot Evlogy closed the monastery gates to the schismatic representatives and did not bless them to enter the church or venerate the relics, explaining that St. Panteleimon’s Monastery does not recognize them as clergy now, nor will they in the future. Other monasteries, including Philothou and Karakallou, have also said that they would shut their gates to the schismatics. The schismatics arrived on Mt. Athos on Thursday and served Vespers, and Liturgy the next day at Pantocrator Monastery. Pantocrator was one of the 5 out of 20 monasteries that had voted to send a delegation to the enthronement of “Metropolitan” Epiphany Dumenko, the primate of the Ukrainian schismatic church, in Kiev on February 3. The delegation has been received at at least one other monastery on the Holy Mountain thus far. Before trying to visit St. Panteleimon’s, they were received by Abbot Bartholomew of New Esphigmenou Monastery yesterday, according to Romfea. The New Esphigmenou brotherhood was created by Constantinople in 2002 to replace that of Esphigmenou which, in taking a stand against Constantinople’s ecumenistic activity, has gone too far in the opposite direction and has schismed from the Church. The Ukrainian delegation exchanged gifts with the brotherhood and venerated the relics housed at the monastery. They discussed with the abbot the “important unifying role” of the Patriarchate of Constantinople, the problems of Esphigmenou, and the need for the unity of all Orthodox Christians. The delegation also invited Archimandrite Bartholomew to visit Ukraine. 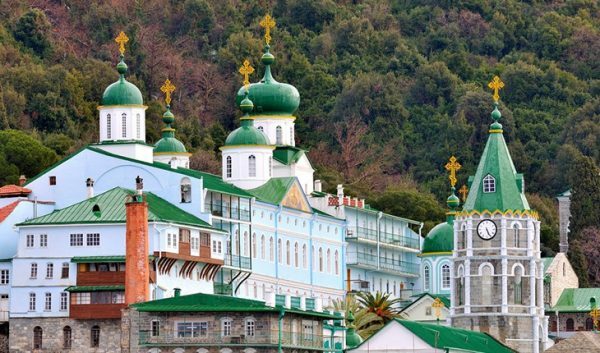 Patriarch Bartholomew ordered the schismatic delegation to visit all 20 monasteries on the Holy Mountain, Bp. Ambrose also wrote. “Xenophontos, Pantocrator, and New Esphigmenou have already entered into communion with schismatics and self-consecrated people, shaking hands with the persecutors of the Church in Ukraine… How subtly the enemy of mankind mocks people!” Bp. Ambrose added. Abbot Alexios of Xenophontos concelebrated at the enthronement of Epiphany Dumenko on February 3, as did a hieromonk from Vatopedi and a hieromonk from a skete under Koutloumousiou Monastery.